This article has been created in order to explain what is the Google Chrome Critical ERROR scam message and how to remove it from your computer, plus how to fix it back to a normal working state and protect it. A new scamming message has been reported by researchers to go by the name Google Chrome Critical ERROR. 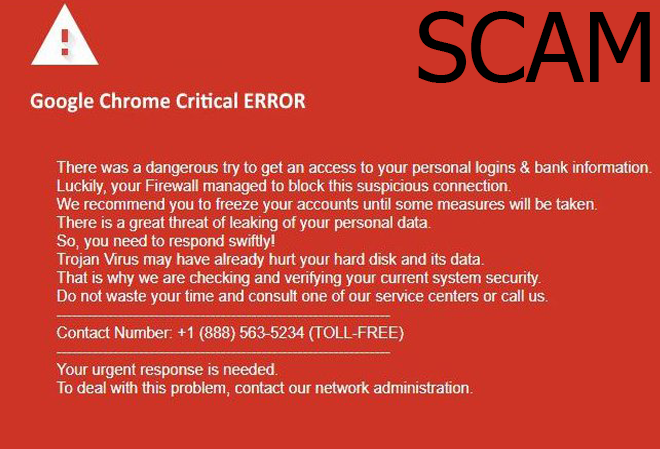 The scam message aims to convince victims that a virus has attempted to enter your computer via Google Chrome, but it has been blocked by Windows Firewall, however the scam also claims that the personal data on the victim’s computer has been severely compromised and he or she should call a tech support number to solve the issue. The scamming message has been reported to appear as a result of having an unwanted program, causing such pop-ups. This is why, if you see the Google Chrome Critical ERROR scam message, recommendations are to read this article and learn how to remove this scamming redirect from your PC and protect it against future intrusive programs. Short Description The software that may be causing this scam may pretend to be a helper program or a browser extension but in fact it causes pop-ups, like the Google Chrome Critical ERROR scamming message.. Symptoms Google Chrome is locked with a tech support scam message which pretends you’re your PC is at risk, asking you to call a tech support number to fix any possible issues. User Experience Join Our Forum to Discuss Google Chrome Critical ERROR Scam. The Google Chrome Critical ERROR scam message has been reported to be associated with a scamming network which spread similar types of messages, called the Critical ERROR scams. They are primarily reported to be seen on Mozilla Firefox, Google Chrome, Microsoft Edge and Internet Explorer. The messages are associated with more than one scam number, but the purpose of the scammers remains the same – to pretend to fix issues that do not exist. More information about the Critical ERROR scams in overall can be found on the related article below. If you have downloaded a program, believing it is legitimate, but the program’s installer also comes with an embedded PUP (Potentially Unwanted Program) which pretends to be added as a free extra, but is actually aiming to do more indirect harm by redirecting you to third-party sites, like the Google Chrome Critical ERROR. If you have added a browser extension to Chrome that is ad supported as a result of already having such an adware program on your PC. 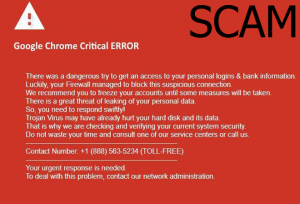 Similar to other tech support scams, the Google Chrome Critical ERROR scamming pop-up aims to display a convincing message, that the victim’s computer has been compromised, even though it’s firewall has prevented a virus. The end goal of the scam is to get you to call the tech support number +1(888)-562-5234. Calling the number is strongly inadvisable, since the scammers may pose as legitimate tech support guys and scam you to pay a hefty sum of money for a service that fixes your computer, even though it is not actually broken. The actual help desk number has been reported by victims at 888notes to be a scamming message which should be ignored. When the victims have called the support number, the scammers pretended to be official Microsoft Tech Support and they scared the victim that they have detected several hundred (over 200) viruses on the computer of the victim. Then, the scammers wanted a large sum of money to be paid (around $800) to fix the issues on the victim’s computer and after some time, they renegotiated the price to fall down to about $100. When the victim refused to pay, the scammers rudely hung up to her. If you have seen the Google Chrome Critical ERROR scamming message, we strongly suggest that you focus on removing it immediately from your web browser and checking if your computer has been affected by malware. In order to make sure that you won’t see any of those message, a tradition antivirus might not be able to help you, since those messages are usually displayed by PUA (Potentially Unwanted Applications) that are classified as low level threats which are from the adware/browser hijacker type. This is why, if you want to fully remove the Google Chrome Critical ERROR Pop-up, we advise that you follow the removal instructions underneath. They are made, to help you to remove the Google Chrome Critical ERROR pop-up either manually or automatically. Be advised that experts outline that the most effective tool against all types of malware, including PUA is advanced anti-malware software. Such program will automatically scan your computer and completely secure it against all types of objects that may be causing these pop-ups on your computer system. And not only this, but such software will also make sure that the Google Chrome Critical ERROR scam is permanently gone and your PC is protected against such pop-up displaying software in the future without you having to waste your time on them. Threats such as Google Chrome Critical ERROR Scam may be persistent. They tend to re-appear if not fully deleted. A malware removal tool like Combo Cleaner will help you to remove malicious programs, saving you the time and the struggle of tracking down numerous malicious files. Threats such as Google Chrome Critical ERROR Scam may be persistent on your system. They tend to re-appear if not fully deleted. A malware removal tool like SpyHunter will help you to remove malicious programs, saving you the time and the struggle of tracking down numerous malicious files. Note! Your computer system may be affected by Google Chrome Critical ERROR Scam and other threats. SpyHunter is a powerful malware removal tool designed to help users with in-depth system security analysis, detection and removal of threats such as Google Chrome Critical ERROR Scam. 1. Install SpyHunter to scan for Google Chrome Critical ERROR Scam and remove them. 2. Scan with SpyHunter, Detect and Remove Google Chrome Critical ERROR Scam. Ransomware infections and Google Chrome Critical ERROR Scam aim to encrypt your files using an encryption algorithm which may be very difficult to decrypt. This is why we have suggested several alternative methods that may help you go around direct decryption and try to restore your files. Bear in mind that these methods may not be 100% effective but may also help you a little or a lot in different situations. Note! Your computer system may be affected by Google Chrome Critical ERROR Scam or other threats. Remove Google Chrome Critical ERROR Scam by cleaning your Browser and Registry. Fix registry entries created by Google Chrome Critical ERROR Scam on your PC. Combo Cleaner is a powerful malware removal tool designed to help users with in-depth system security analysis, detection and removal of threats such as Google Chrome Critical ERROR Scam. Step 5: In the Applications menu, look for any suspicious app or an app with a name, similar or identical to Google Chrome Critical ERROR Scam. If you find it, right-click on the app and select “Move to Trash”. Step 6: Select Accounts, after which click on the Login Items preference. Your Mac will then show you a list of items that start automatically when you log in. 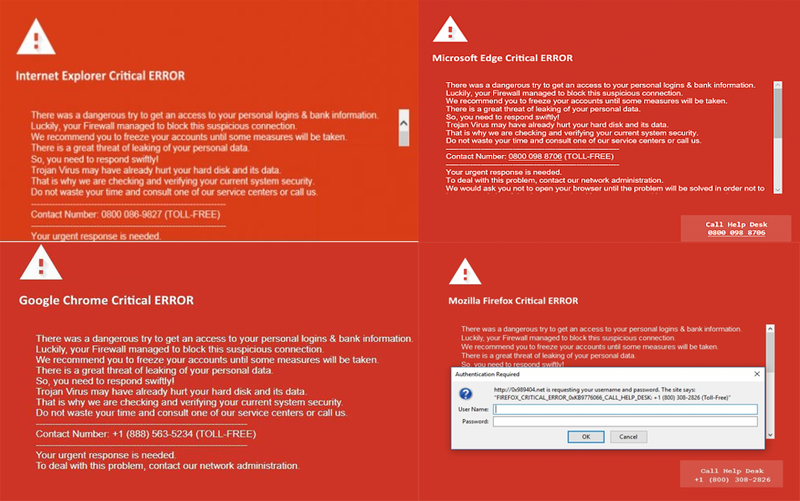 Look for any suspicious apps identical or similar to Google Chrome Critical ERROR Scam. Check the app you want to stop from running automatically and then select on the Minus (“–“) icon to hide it. Remove Google Chrome Critical ERROR Scam – related extensions from your Mac’s browsers. A pop-up window will appear asking for confirmation to uninstall the extension. Select ‘Uninstall’ again, and the Google Chrome Critical ERROR Scam will be removed. When you are facing problems on your Mac as a result of unwanted scripts and programs such as Google Chrome Critical ERROR Scam, the recommended way of eliminating the threat is by using an anti-malware program. Combo Cleaner offers advanced security features along with other modules that will improve your Mac’s security and protect it in the future. Hey !, I found this information for you: "Google Chrome Critical ERROR Scam Pop-Up – How to Remove + Fix Your PC". Here is the website link: https://sensorstechforum.com/google-chrome-critical-error-scam-pop-remove-fix-pc/. Thank you.